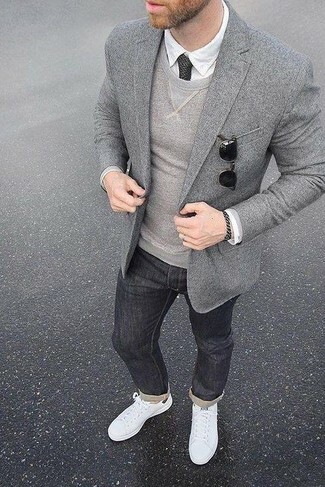 For a casually elegant ensemble, make a grey wool blazer and charcoal jeans your outfit choice — these two pieces fit really well together. For something more on the daring side to complement this look, choose a pair of Gucci new ace clean sneaker. For a casually elegant getup, marry a navy overcoat with black linen chinos — these pieces fit really well together. Throw in a pair of Gucci new ace clean sneaker from Nordstrom to have some fun with things. If you're hunting for a casual yet dapper look, choose a navy denim jacket and pink chinos. Both pieces are totally comfortable and will look great together. Gucci new ace clean sneaker will deliver a more relaxed feel to your getup. This combination of a white print henley shirt and olive shorts is solid proof that a simple casual look doesn't have to be boring. 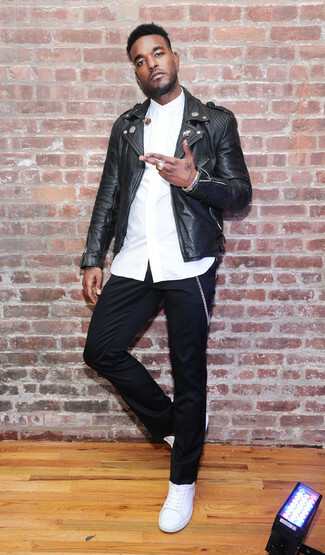 The whole ensemble comes together when you complete this getup with a pair of white leather low top sneakers. If you're searching for a casual yet sharp look, consider wearing a black leather biker jacket and black chinos. As well as totally comfortable, both garments look stunning paired together. For shoes, choose a pair of white leather low top sneakers. If you're on the hunt for a casual yet seriously stylish getup, dress in a black leather bomber jacket and black and white vertical striped sweatpants. Both items are totally comfortable and will look great together. When it comes to shoes, this ensemble is round off nicely with Gucci new ace clean sneaker. 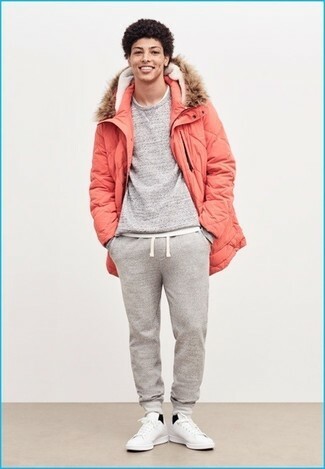 We all want comfort when it comes to dressing up, and this combination of an orange parka and grey sweatpants is a good illustration of that. Got bored with this look? Enter white leather low top sneakers to switch things up. 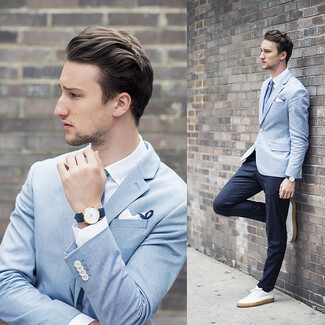 For a nothing less than incredibly stylish outfit, try teaming a light blue blazer with navy dress pants. Gucci new ace clean sneaker from Nordstrom will deliver more playfulness to your getup. 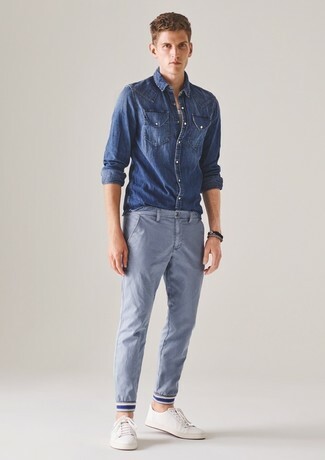 If you're in search of a casual yet on-trend getup, rock a blue denim shirt with light blue chinos. Both pieces are totally comfortable and will look great together. 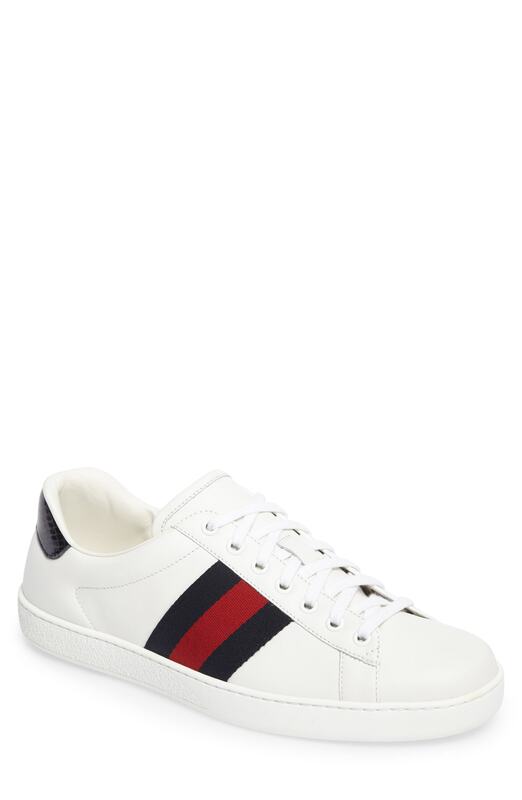 For shoes, opt for a pair of Gucci new ace clean sneaker from Nordstrom.